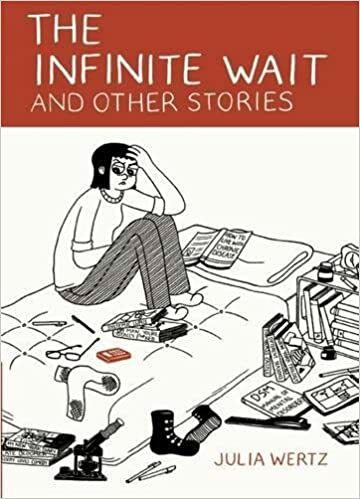 The Infinite Wait and Other Stories – loudlatinlaughing – Euge! Euge! I’m on a Julia Wertz tear lately, scarfing down her graphic novels a few blocks from the locations she’s mentioning in SF, namedropping Bean Bag and Cafe Abir and Dog Eared and Cafe Le Soleil and BrainWash (where her brother worked). Highly entertaining autobiographical work that explores how she dealt with life in Napa, then SF as a student where she found out she had Lupus, then bailing and heading to Brooklyn. While recuperating(?) from her Lupus diagnosis, she discovered Julie Doucet and other graphic novelists, consumed their work voraciously and started doing her own, feeling like she’d finally found what she was meant to do with her life. Great great great stuff.